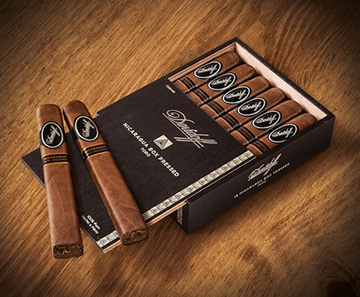 Springboarding off the acclaimed Davidoff Nicaragua cigar line, Davidoff takes us on another exciting journey with the luxury cigar company's first ever box pressed cigars ~ Davidoff Nicaragua Box Pressed. These medium- to full-bodied puros offer adventurous cigar aficionados a wilder, more intense smoke than the original Nicaragua with a blend boosted by a fiery Esteli Ligero leaf that complements aged Jalapa, Ometepe, and Condega long-filler tobaccos for a sweet-bitter palate stimulation. Half of a filler leaf is removed for box pressing, which produces better draw and more pronounced flavors and aromas. The dark, oily Habano Nicaragua Oscuro wrapper is richer and sharper too. Complex and perfectly balanced with uniquely creamy, sweet, spicy, and bitter flavors, Davidoff Nicaragua Box Pressed are impeccably constructed premium cigars superbly crafted to fill your time beautifully.